This portfolio will help you record the certificates and diplomas you may have achieved. It has three parts: a Passport in which you can record your proficiency in what you already know; a Biography in which you reflect on your own learning progress and record your learning achievements and objectives; and a Dossier in which you keep examples of the work that you have produced during the project (writings, recordings, photos and videos, etc). • to see how well an exchange pupil that you might host speaks other languages and is prepared for Europe and the wider world. A Portfolio belongs to you personally and reflects your self-evaluation. It will not be graded by the teachers, although they will give feed-back, and of course you can put examples of your work in the dossier that will count for study points. Please fill in everything as you truly perceive it, then it will be most helpful. 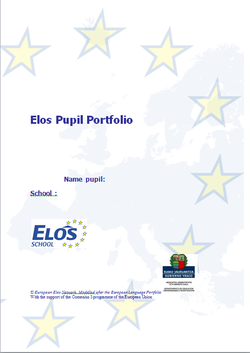 The school can subscribe a certificate of the content of this document if the students apply for it.